I would like to thank the publishers for an arc copy of this book in return for an honest review via Bookbridgr. 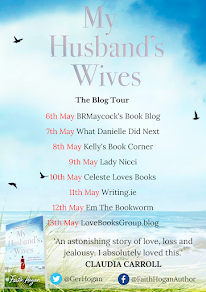 Emmy is stunned when she returns home from work on afternoon to find that the house that she hares with her elderly father is being robbed, and to make matters worse her father is sitting by and allowing it to happen. But soon, Emmy finds herself to be more shocked when she realises that they are not being robbed and that the strange man looking around her home is a Bailiff who has come to see what he can get from the house due to the mortgage not being paid over the last few months. However, Emmy is lucky and manages to buy herself some time to come up with the money, but it costs her the office collection for a present for two co-workers who have gotten engaged. When her boss finds out what has happened to the money, coupled with the fact that Emmy's sales are below dismal, Emmy knows that not only will she lose her home, she's about to lose her job as well! But, Emmy finds that she is saved by the bell when her boss has no other option than to send Emmy on a twelve week working holiday to a vineyard in France. Could this be the answer to Emmy's prayers, and with romance in the air, Emmy goes on the adventure of a lifetime to save her job, her home and maybe find herself in the process. Late Summer in the Vineyard is just the perfect summer read. There wasn't a thing about this book that I didn't like. It contains just the right amount of humour, as well as touching on some more serious elements also. All in all, Late Summer in the Vineyard is a bright, summery, feel good book, that has the ability to make the sun shine on a dull cloudy day. I adored the characters in this book. Each one of them brought something special to the story, especially Emmy and Isaac. I loved how each character came with a very well thought out back story, that not only gives the readers a great insight into the lives of the characters, but also gives the reader the chance to really get to know each character very well. To my dismay, this is the first book that I have read by Jo Thomas. I own both The Olive Branch and The Oyster Catcher, but I haven't gotten around to reading either so far. All that has changed after reading this gem of a book, as both books have now been moved to the top of my to-be-read pile and I can't wait to lose myself in both. On top of Late Summer in the Vineyard being a cracking story, it also has one of the most beautifully eye-catching summery covers, which will no doubt catch the attention of many readers, with the beautiful colours that just jump straight off the shelf. To say that I this book is my cup of tea is a huge understatement. I loved everything about this book and I more than enjoyed the time that I spent with Emmy and the gang. Jo Thomas has the power to transport you to a French Vineyard and take you on the adventure of a lifetime. 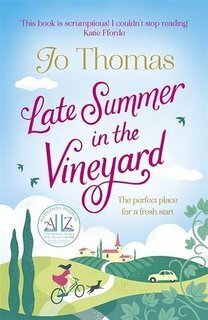 Late Summer in the Vineyard is beautifully written, full of surprises and utterly heartwarming. I can't recommend it enough. This looks amazing, I can't wait to read it!